Formation Zone clients TruVision, the award winning virtual reality company, have been to see one of their projects for HAB Housing brought to life. HAB Housing, stands for Happiness, Architecture, Beauty, and has changed the way the UK delivers new homes. Recently shortlisted in the National Housing Design Awards 2017 for 2 projects, HAB’s mission is to make homes that lift the spirits, are a pleasure to live in and a joy to behold. Founded by Kevin McCloud in 2007 popular author and presenter of the TV programme Grand Designs, HAB has developments in Oxfordshire, Winchester and now Bristol, The company specialises in volume, custom build houses that are sold off plan. In 2016, HAB embraced Virtual Reality (VR) as part of their sales toolkit, working with TruVision to bring its HAB housing projects to life. The innovative use of VR technology is a breaking the mould of standardised, repetitive modes of house marketing and means that customers are able to visualise and walk through their home before the build begins. 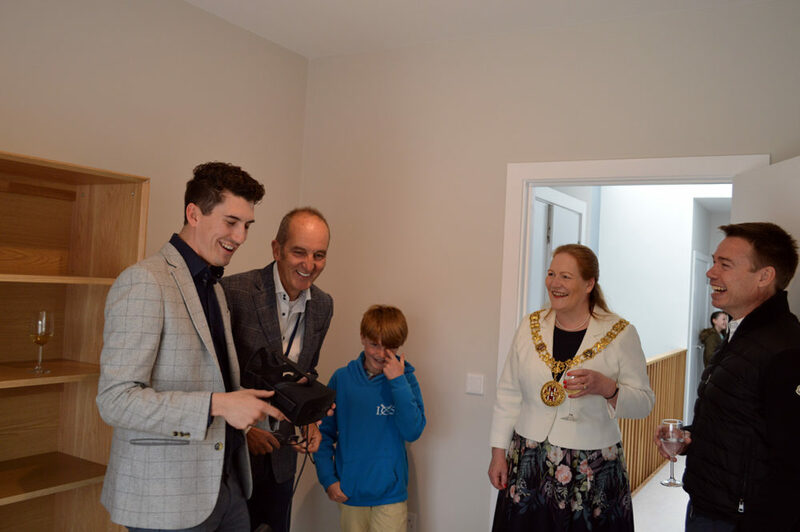 TruVision joined Kevin McCloud, Chairman of HAB and the rest of the HAB team along with Graeme Le Saux, Fields in Trust Trustee and former England International Footballer, to open the latest HAB show home in Bristol in April 2017. It was a very special experience to walk around the finished product after building the virtual home experience in July 2016.